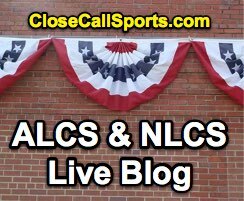 Join us for discussion of the 2018 American League and National League Championship Series. Umpires Scott Barry (NL, LAD@MIL) and James Hoye (AL, HOU@BOS) are game one plate umpires; Gerry Davis (NLCS) and Joe West (ALCS) are umpire crew chiefs. Related: 2018 League Championship Series Umpires (10/11/18). Home plate umpire performance is listed following the completion of each contest according to UEFL f/x (Statcast/pitch f/x data and application of UEFL Rules 6-2-b-a [horizontal bound, "Kulpa Rule"] and 6-2-b-b [vertical strike zone, "Miller Rule"]). Fouls, swinging strikes, balls batted into play, and hit-by-pitches are excluded from the analysis. Pitch plot/graphics are included via the "pfx" link for illustrative purposes only. Related Post: UEFL f/x vs K-Zone and the Player-Umpire Disconnect (How #s work) (10/4/18). - 10/12 LAD@MIL Gm 1: Scott Barry: pfx. 110/112 Balls + 43/48 Strikes = 153/160 = 95.6%. +1 MIL. - 10/13 LAD@MIL Gm 2: Alan Porter: pfx. 101/101 Balls + 45/48 Strikes = 146/149 = 98.0%. +1 LAD. - 10/13 HOU@BOS Gm 1: James Hoye: pfx. 136/137 Balls + 61/67 Strikes = 197/204 = 96.6%. +3 HOU. - 10/14 HOU@BOS Gm 2: Vic Carapazza: pfx. 107/108 Balls + 43/47 Strikes = 150/155 = 96.8%. +3 HOU. - 10/15 MIL@LAD Gm 3: Gerry Davis: pfx. 87/91 Balls + 47/50 Strikes = 134/141 = 95.0%. +1 MIL. - 10/16 BOS@HOU Gm 3: Joe West: pfx. 105/105 Balls + 54/55 Strikes = 159/160 = 99.4%. +1 BOS. - 10/16 MIL@LAD Gm 4: Hunter Wendelstedt: pfx. 130/131 Balls + 57/62 Strikes = 187/193 = 96.9%. +0 Nu. - 10/17 MIL@LAD Gm 5: Jim Wolf: pfx. 83/84 Balls + 45/48 Strikes = 128/132 = 97.0%. +0 Nu. - 10/17 BOS@HOU Gm 4: Mark Carlson: pfx. 130/130 Balls + 58/61 Strikes = 188/191 = 98.4%. +1 BOS. - 10/18 BOS@HOU Gm 5: Chris Guccione: pfx. 84/85 Balls + 43/47 Strikes = 127/132 = 96.2%. +1 BOS. Series Complete (ALCS BOS Over HOU 4-1): 821/842 = 97.5%. Net Skew +3 HOU. - 10/19 LAD@MIL Gm 6: Brian Gorman: pfx. 110/111 Balls + 44/51 Strikes = 154/162 = 95.1%. +0 Nu. - 10/20 LAD@MIL Gm 7*: Greg Gibson: pfx. 87/87 Balls + 54/55 Strikes = 141/142 = 99.3%. +1 LA. Series Complete (NLCS LAD Over MIL 4-3): 1043/1079 = 96.7%. Net Skew +0 Neutral. Note: The highest plate score during the 2017 AL/NLCS was Chad Fairchild's 97.4% (ALCS Gm 1). The highest plate score during the 2017 Postseason was Chad Fairchild's 97.4% (ALCS Gm 1). The highest plate score during the 2018 Postseason, thus far, was Jim Wolf's 98.8% (AL WC Gm).